From Illyrian times until the Ottoman invasion, the ancient settlement of Blagaj was the centre of political power and Mostar was no more than a tiny settlement along the banks of the Neretva, It is believed that before Herzegovina fell to the Ottomans, the settlement of Mostar had only 19 houses with a small suspension bridge that united both banks. The men that guarded this bridge were called mostari( bridge keepers)Â and it is presumed that the town is named after them. With the arrival of the Ottomans came relative peace and stability. The mountaintop fortress, used since Illyrian times and particularly by the Bosnian aristocracy in the centuries before Herzegovina was conquered, lost a great deal of significance. 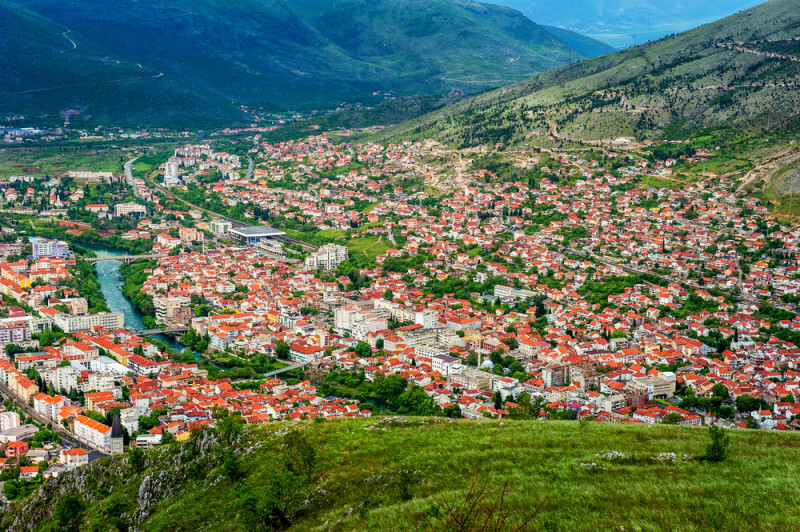 The fertile but exposed valley, in which Mostar is located was an ideal place for building a city-so that is exactly what Ottomans did. Herzegovina officially came under Ottoman rule in 1482. It did not take long for Mostar to become the center of Ottoman administrative and military rule in Herzegovina. The old town (ÄarÅ¡ija) that developed around the new stone bridge (Stari most) was completed by Dalmatian craftsmen, but in Ottoman design, in 1566. The oriental part of the city still preserves its old tradition of highly skilled craftsmen in metal engraving, painting and rug-weaving. With the old bridge at the centre, new quarters began to spring up on both sides of the Neretva, Mosques and medresas( schools) were constructed as Islam spread through the growing town. In the late 16th century and early 17th centuries, manu of Mostar’s most beautiful and significant Islamic structures were built. The ÄŒejvan-ÄŒehaj Mosque was constructed in 1552 and is the oldest surviving monument of Ottoman rule in Herzegovina. The most famous oriental object in Mostar is the KaraÄ‘oz-beg mosque that was built in 1557. In 1558, eight years before the contruction of the Old Bridge, the Kriva Ä†uprija Bridge was built over the Radobolja Stream that feeds into the Neretva. It was a prototype for the Old Bridge. 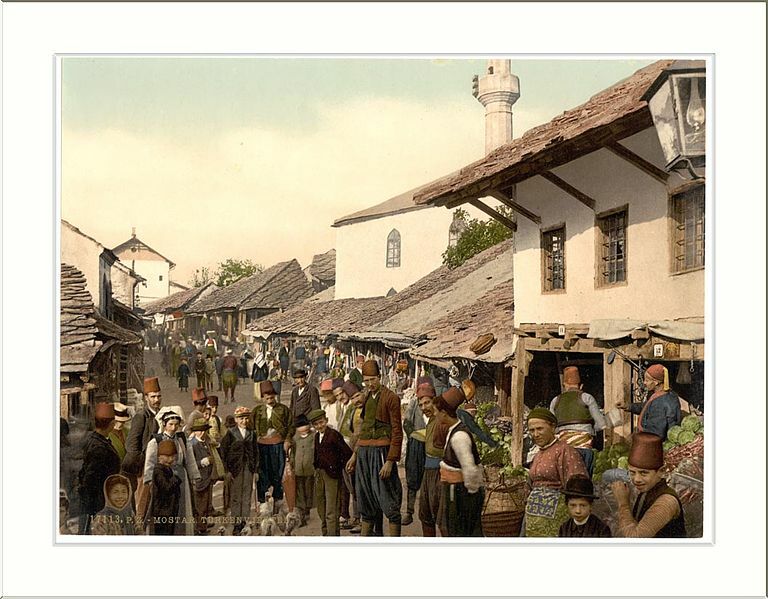 During Ottoman times Mostar quickly became a key trading partner with Dubrovnik and othe coastal cities. Caravan routes led directly to Mostar, carrying Dalmatian goods such as olive oil, fish and linen. 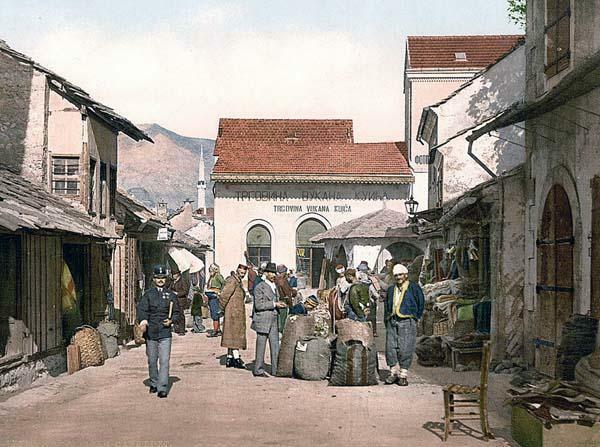 Cargoes of wool, meat, honey and oats were shipped from Mostar towards the seaside cities. You can still walk the streets of the old town and craftsmen and artisans of all sort selling their wares. Life in the city was different and so were the customs. There was a strong oriental influence in the city which reflected on the use of particular materials and cuts. In the first two centuries of Ottoman rule, Mostar enjoyed a long peaceful period of cultural, political, and economic geowth. All three religious communities lived in harmony. Muslim obviously enjoyed more freedoms and tax breaks but the survival and growth of the Christian communities indicates that the Ottomans had a farily high level of tolerance towards the Christian population. The second half of the Ottoman’s four centuries of rule was less peaceful, and strifes and rebellions became commonplace. After the third failure of the Ottomans in the battle for Vienna in 1683, the empire began its decline. Uprisings were frequent in the 18th Â century and in order to appease many of the internal opposing forces, both Muslim and Christian, the Ottomans granted certain freedoms. The Old Ortodox Church was renovated in 1833 and a Catholic Church was constructed in 1864. The end of the 19th century marked the final decline of the Ottomans, and after a three-year uprising throughout the country from 1875 to 1878, the empire collapsed. Opportunistic Austro-Hungary jumped right in and include Bosnia and Herzegovina in its administrative region. A railroad was contructed immediately, adding a European flavor to the oriental town. During the short period of the Austro-Hungarians, a public bath was built, many newspapers and periodicals were established, more schools and bridges were erected and the city expanded its road system. All along the outskirts of the old twon one can see the Viennese-style architecture from the period. Austro-Hungarian rule ended with the assasination of Prince Ferdinand in Sarajevo. In the decades that followed, much of Bosnia and Herzegovina experienced harsh economic and political struggles. With the end of World War II and the victory of Tito’s partisans came a challenging but peaceful time. 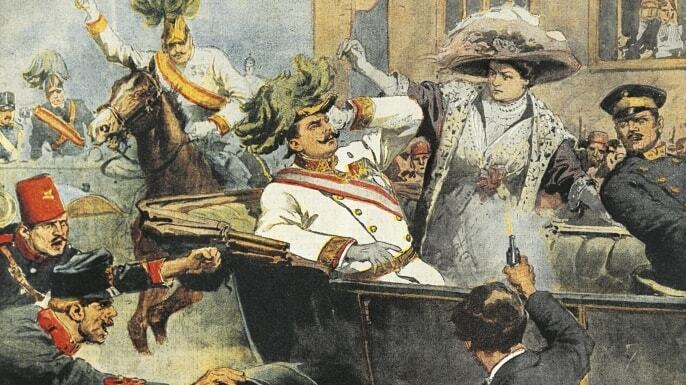 On June 28, 1914, a teenage Serbian nationalist gunned down Archduke Franz Ferdinand and his wife, Sophie, as their motorcade maneuvered through the streets of Sarajevo. Next in line for the Austro-Hungarian throne, Ferdinand had not been particularly well liked in aristocratic circles. Nonetheless, his death quickly set off a chain reaction of events culminating in the outbreak of World War I.
Mostar became on of the major socialist strongholds in the former Yugoslavia. It had the highest rate of mixed marriages and continued to be the important city of Herzegovina.